Discover life and business tips from Cheekys' founder, who survived a devastating childhood and turned her tiny Idaho shop into a multi-million dollar brand, in this "manifesto on how to do everything from overcome haters to persevere in business" (Lee Woodruff, number one best-selling author). New Plymouth, Idaho. Population 1536. It doesn't look like much from Rural Route 30, but it was here, in this quiet town, that a mother of four faced down her hard past, poverty, self-doubt, and a reluctant customer base. And she created something unexpected: a multi-million dollar FRBR (For Rural, By Rural) business empire. Her name is Jessi Roberts, and the business is Cheekys, which started with six purses and a tanning bed. 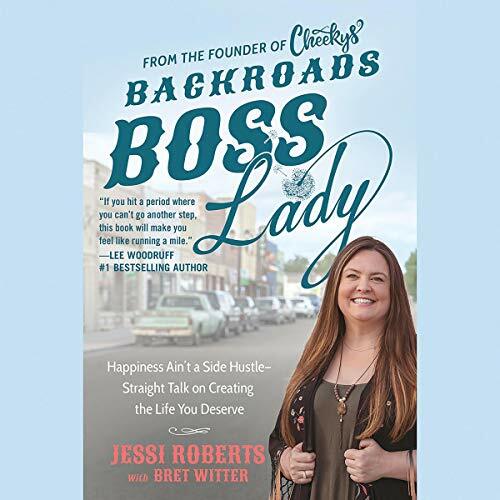 Now in her book, Jessi reveals how she grew one small store hurdle-by-hurdle into a national clothing and accessories brand with a one-and-a-half-million-strong community. Best of all, she did it by standing tall for her values: Always be kind, lift up the next gal, and treat employees and customers like family. More than a business book, Backroads Boss Lady is about embracing your passion even when others don't see value in it - or you - and about putting food on the table and believing in yourself. Brimming with authenticity, it gives the warts-and-all, love-it-despite-it skinny on rural life, community, and contentment without compromise. This girl is a true braveheart. This doesn't sound like an easy story to tell. Kudos to you Jessi! I feel like we've known one another a lifetime. Not everyone takes a tragic childhood and on to adult life hurdles with a positive outcome. Your honesty, work ethic and drive are truly boss lady deserving. I listened to your story to and from work every day. I live in Tonopah, AZ. It's about an hr drive for me to my work. I dont care for the city life, but I'm a nurse and have kid's and farm animals to feed. Your book helped me wind down after a long shift. I laughed and cried with you. Thank you for telling your story. I really thought this was going to be another one of those “I made $1,000,000 and you can, too!” books. Wow, did I underestimate Jessi Roberts! Yes, this is a book about a multi-million dollar business, but it’s so much more. I love that Jessi wrote about everything, and I mean everything that made her who she is. I would recommend this book (print and audio) for any woman who needs to feel empowered. To any woman who needs to know you’re not alone, in whatever it is you may be going through, listen to Jessi tell you her story. Loved this audio book! Jessi's story is one of perseverance. She has overcome so many obstacles in her personal life and business. If you are looking for something that is heartfelt and inspiring you should definitely give it a read (or listen). I’m an Idaho girl and I have loved Cheeky’s from the beginning and I loved this whole book, from the beginning. That Farm Girl leather bracelet that I bought from the original store has been an all time favorite. What an amazing journey you have been on and thank you for sharing it with the world. I can’t wait for the new store to open. What an amazing book!! I love her honesty and the fact she just puts in all out there!